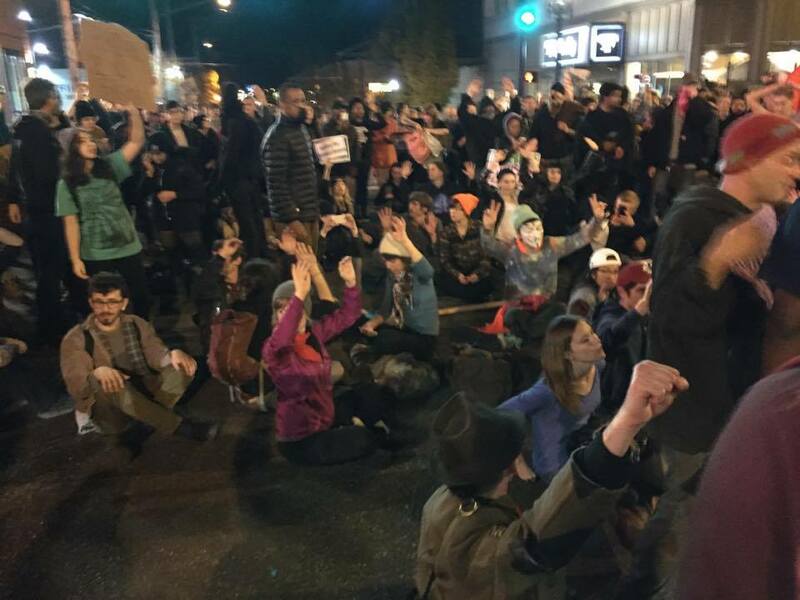 Here is a detailed look at the recent Mike Brown Solidarity Action in Portland, Oregon, and how it can play into long-term organizing and housing justice. A large contingent began to form that did not want to end the action at that point, many calling for direct action at the Justice Center openly. From a third to half of the crowd broke away at this point and led an unpermitted march that again took the streets over and head towards the Morrison Bridge. Here protesters began to push against the forming police force in an effort to take the bridge, with police beginning to shove through the crowd and drive motorcycles into the crowd. The march moved back down the street and took over the Burnside Bridge, making it across the river and blocking the intersection on the other side. Moving through the Water District, the next spot was to openly block Interstate 5 from an open park, the same way that organizers have done so in Oakland and Los Angeles. It was at this point that the police force took another turn and began attacking protesters with the riot-prepared troops and cavalry. As hundred of protesters attempted to stage a sit-in on the freeway, the police began swinging batons and letting pepper spray loose. Participants of color had to be treated by street medics for pepper spray directly into their eyes, which is an irony that must have been lost on the Portland Police Department. A former member of the Portland Solidarity Network, and close ally, was seriously injured by police batons, and had to be cared for by a street medic before being rushed to the emergency room. A move was made to take the next bridge and head back into downtown, though police were beginning to pick off large portions of protesters by blocking them onto portions of the bridge and going for mass arrests. Luckily, many people were saved from being taken into custody as unarrests in the chaos of the freeway action were roundly successful. From here protesters made it in the direction of PGE Park, where a now fully militarized police force began using aggressive crowd dispersal tactics. Though there were seven arrests reported, the numbers could have been much higher without a conscious move by the people on the ground to keep the crowd together and to watch out for the treatment of fellow protesters. Things ramped up even more aggressively as the police riot van had its windows smashed in and there were reports of protestor injuries increasing rapidly. An action like this shows both the passion and desire that is necessary for mass movements, and the ability to think in a more radical context to directly confront the kind of racial animosity that has tarnished our local and national institutions. Though we are incredibly happy to see the actions play out as they have, we also want to see this turn into long-term organizing that will be able to continue to target this systemic inequality. The kind of racism that was implicit and led to both the shooting of Mike Brown by Darren Wilson, and the several police murders in the Portland area, is just as prevalent in people’s workplaces and housing situations. Redlining, Section 8 and rental discrimination, unequal foreclosure rates, and inaccess to public housing all mark institutionalized housing oppression against people of color in our communities. We are committing to work with tenants across the city to use community solidarity to force concessions and change in people’s neighborhoods and housing complexes. These racial issues are not just at play in loud points of cruel violence, but also the subtle evictions that we see in apartment complexes across all cities and the kind of gentrification that turns previously communities of color into trendy shopping centers for upper-class whites. It became clear that the financial crisis of 2008, and the subsequent foreclosure crisis of 2010, hit communities of color especially hard, but that misses a couple clear points. All things in the current capitalist system have been hard for working people, and especially people of color. Housing, jobs, healthcare, education, environmental issues, are all made exceedingly difficult for people of color, further building on an already insurmountable mountain of inaccess and degradation. The housing crisis has been a permanent state of being for communities of color, and through that we can see some of the less flashy forms of racism deeply laid into our most fundamental community institutions. The tragedy of Michael Brown can be a rallying point for challenging racism, both explicit and hidden, and target everything from racist murders in our city streets to discrimination that makes families of color have almost double the risk of houselessness. Without institutionalized racism directly, and naming it for what it is, we will never be able to see the complex matrix of issues that make universal housing a current impossibility. Let’s take the anger and determination that we saw on November 25th and continue to challenge these institutions, and hopefully we can use this as an opportunity to spotlight the racism that is central to the unequal access to housing in this city and country. When will black lives matter?